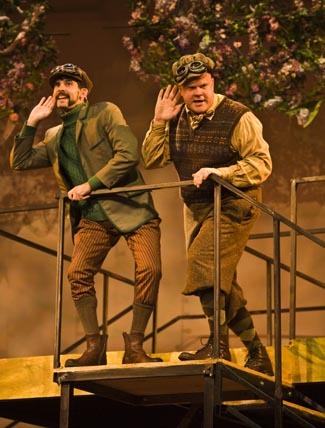 After a brief hiatus, the popular year-end holiday co-production by Shakespeare Santa Cruz and the Theater Arts Department returns this year for A Year with Frog and Toad—running through December 11 at UCSC’s Mainstage Theater. The show is directed by Art Manke, who just directed The Three Musketeers at Shakespeare Santa Cruz’s 2011 summer festival, as well as Bach at Leipzig in 2008. Manke is a five-time winner of the Los Angeles Drama Critics Circle Award and has worked as director and choreographer at such venues as the South Coast Repertory Theatre, Oregon Shakespeare Festival, and Denver Center Theatre Company. “This show has a unique pedigree in that it's a show written for a younger audience that has gone on to have widespread success in traditionally more ‘adult’ marketplaces, such as Broadway and the regional theatre circuit,” noted Kyle Clausen, managing director of Shakespeare Santa Cruz. “I think that's a testament to the strong source material, and the quality of the script and score, which are first-rate,” he added. The cast features American Conservatory Theatre’s Nick Gabriel and popular SSC actor Mike Ryan, who has appeared in more than 30 SSC productions, including playing both Antipholus twins in 2011’s The Comedy of Errors. “We are pleased to have Nick Gabriel working with us for the first time, playing Frog,” said Clausen. 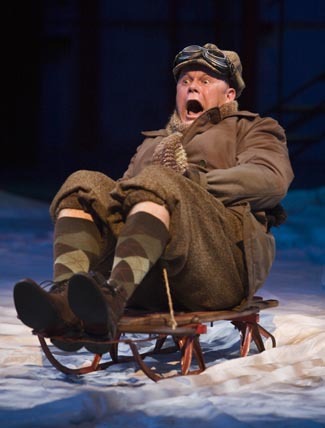 Gabriel most recently appeared in ACT’s season opener, the satiric comedy Once In a Lifetime, directed by former SSC associate artistic director Mark Rucker. Clausen observed that this year's show has a smaller cast than past holiday shows produced by SSC and Theater Arts. Theater Arts Department Chair David Lee Cuthbert concurred. “This is a wonderful opportunity for our students to gain experience working with a professional company, and I know it’s a tradition loved by the community,” said Cuthbert. Joining Manke on the creative end are music director Colin Hannon, scenic designer (and associate professor of design) Kate Edmunds, costume designer B. Modern, and lighting designer Kent Dorsey. Reduced-price matinees of A Year with Frog and Toad for school groups are supported by the Community Foundation of Santa Cruz County. For more information, visit the Shakespeare Santa Cruz web site or call the UCSC Ticket Office at (831) 459-2159. Tickets are also available at the Civic Center Auditorium Box Office in downtown Santa Cruz.